“Communication with a system” is designed and realized like a cybernetic model. The “Value Eco-System” describes a new model for business communication and enables the examination of all existing and new graphic communications measures and activities, and, insofar adequate, to adapt them or integrate them as they are. The quality and effectiveness of the communication work is dependent on the level of the ability for communication of the companies and their employees. Thus, four of the six system areas of the Value Eco-System are to be designed to evaluate own abilities and to improve them (ValueAudit), to conduct training over the access to basic knowledge and Best Practice-examples (ValueAcademy), and to conduct the finding of relevant communication innovations systematically (ValueScouting). The knowledge management and the knowledge mediation for valuable communication are decisive (ValueCoaching) and no longer only the available means and resources for communication campaigns, which are organised by external providers of ideas and media platform operators. It is decisive to mediate content over own, controlled intermedial communication systems (ValueMedia) and to enable market interactions linked on this basis (ValueNetwork, ValueCommunities). The Value Eco-System assumes a function of being a point of intersection that is used and “fed” by both main departments. It can be organised and created such that the necessary communication and interaction processes run automatically and can be flexibly adapted or optimised through the communication project management. It becomes decisive to be able to watch, evaluate and control all activities in real-time over a communication cockpit. The cockpit must allow highest possible transparency, as the management committees must be able to call up an up to date and true status about success or deficits in the graphic communications work at all times. How can communicative ability be evaluated? The analysis and evaluation of the communicative ability of an enterprise is a basic requirement for “Graphic communications with a system” in order to enable valuable communication. So far, this is not done in practice. Much more, objects of testing and analysis are which communication measures in image/brand build up and care and in sales and turnover promoting campaign provide what kind of effects. For every communication channel there are own, specifically designed evaluation criteria. Due to current research results, we also know that special advertisement forms, “Special Effects” or Crossmedia-campaigns in the so-called “marketing communication” are always more successful, but also always cost more [cf. among others Dr. Peter Haller, GfK: “Building Best Brands”, Munich 2009]. The demand for the best possible effect of specific communication measures however does still not answer that for the quality of the communicative ability of a company. Completely other factors and influences are to be evaluated here, which exceed the range of the classic advertisement research or “Media-Audits” by far. The value of the communication must take place through systematic research, continuous qualities monitoring and the central control of the business communication. Within the Value Eco-System, this is done through the “ValueAudit”. A questionnaire is used at first via “ValueCheck” that contains eight topic areas with up to 25 questions each that are answered in a “Yes-or-No-statement”-rhythm. The results are displayed in a “Value Score Index” that includes a maximum of one hundred achievable points. The questioning is conducted by the Value-Auditor with decision-makers in the company. The evaluation supplies conclusive, concrete criteria for the improvement and innovation options of the organisation and structures, the communication architecture, the communication processes, the communication channels and means. In ValueProfile-workshops the results can be presented, discussed, and realized in recommendations for action including a roadmap. On this basis, an integrated evaluation of the communication ability is possible; regular updates allow improvements. 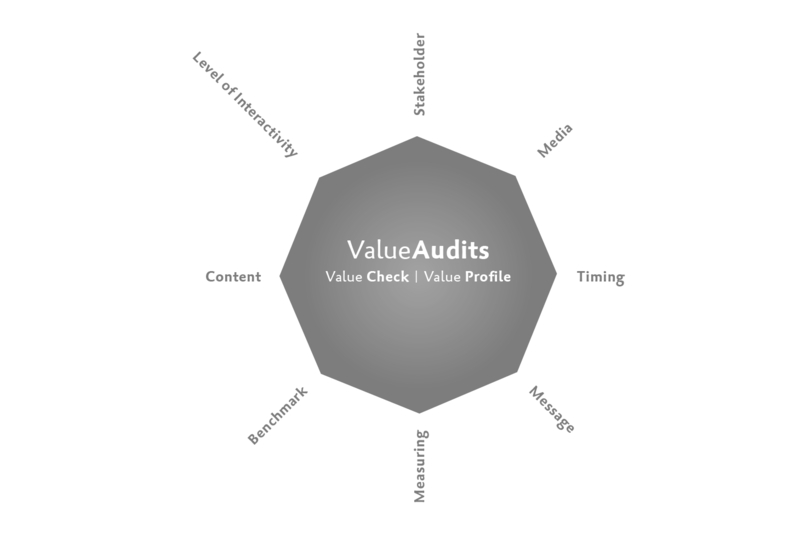 It is useful to expand the ValueAudits to branches and economic areas, in order to be able to critically examine and optimise the own abilities over benchmark comparisons. The strategic analysis is done via ValueCheck and ValueProfile, which supplies the design of a new communication architecture as a result. The performance of the communication architecture is dependant on the quality of the ValueScouting, which means the finding of adequate, relevant communication innovations that are continuously illustratable in the ValueAcademy based on Knowledge Transfer with Best-Practice-evaluations. The finding, the selection and the implementation of communication innovations must be understood as an iterative process that can be evaluated for its value and effect through the ValueAudits and be optimised anytime.